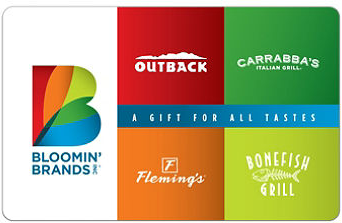 Bloomin’ Brands gift cards are the freshest way to see for yourself how one card can offer so many appetizing choices. From steak, seafood to classic Italian, Bloomin’ Brands restaurants satisfy every craving. Our card can be redeemed at any of the following restaurants: Outback Steakhouse, Carrabba's Italian Grill, Bonefish Grill and Fleming's Prime Steakhouse & Wine Bar. Sell Bloomin' Brands gift cards on Cardpool.